Video with sound is way catchier. Even the coolest visuals are raw without sound. Audio effects add liveliness and color up the video. 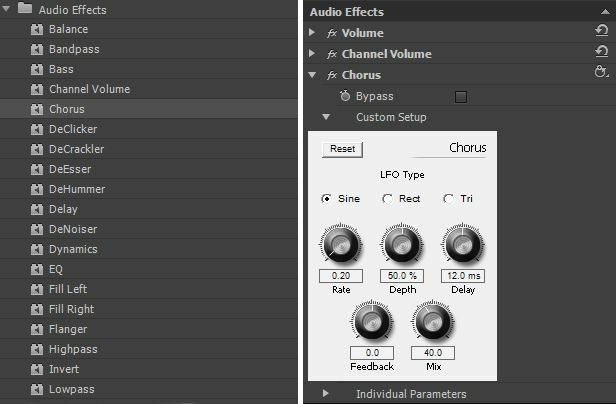 Adobe Premiere Pro has a number of built-in audio effects to help you improve the sound of your project. Most effects are available for 5.1, stereo or mono clip and can be applied both to clips and separate tracks. Let’s look at the most often used filters. The sound is superimposed on itself with a little delay so that it gets the sonic warmth. This effect has several presets that can be further adjusted. The Balance effect lets you control the relative volumes of the left and right channels. The setting option is pretty clear; by moving the slider you adjust the proportion of the left and the right channel. For example, moving the slider to the left to the value (-60) means that 60 percent of a signal will come out of the left speaker. The right channel is adjusted the same way. This effect is available for stereo clips only. This effect has no settings window and no presets. The Bandpass effect removes frequencies outside the specified range of frequencies. You just need to specify the width of the frequency band. Bandpass can work for simulating telephone conversation, for example. The Bass effect lets you increase or decrease lower frequencies (200 Hz and below). A Flanger effect plays the original sound and adds a delayed signal to it. Delay time varies from 1 to 10 milliseconds. This effect also plays the original audio with multiple delays but then adds several timbres of the original sound. The DeEsser effect removes unpleasant sibilance, DeClicker clears the audio signal from unwanted clicks. You don’t need to adjust these effects. Use Distortion Effect to make the sound gritty and saturated. It works well for amplifying emotions (growling, screaming). This effect is for equalization and densification of the sound. It also can cut out high frequencies. EQ is a sound frequency level controller. This effect processes the sound by increasing the amplitude of frequencies around a certain central frequency. Center - specifies the frequency in the center of the chosen range. Q - specifies the width of the frequency range that will be affected. Gain – specifies the amount by which to increase or decrease a frequency band (between -20 and 20 dB). Phaser is an audio effect caused by mixing a phase-shifted by a varying degree sound with the original signal. Phaser effect is similar to Flanger. The result of both effects is a distinctive complex non-stationary signal which comes out as a surround, floaty, ethereal sound. Despite similar functioning of these effects, the output sounds differ from each other. The Pitch Shifter effect adjusts the pitch of the incoming signal. It has presets which allow for deepening high voices or increase the pitch to make the voice sound cartoon-like without affecting on video playback speed. The Reverb effect adds ambiance and warmth to an audio by simulating the sound of the audio playing in a room. 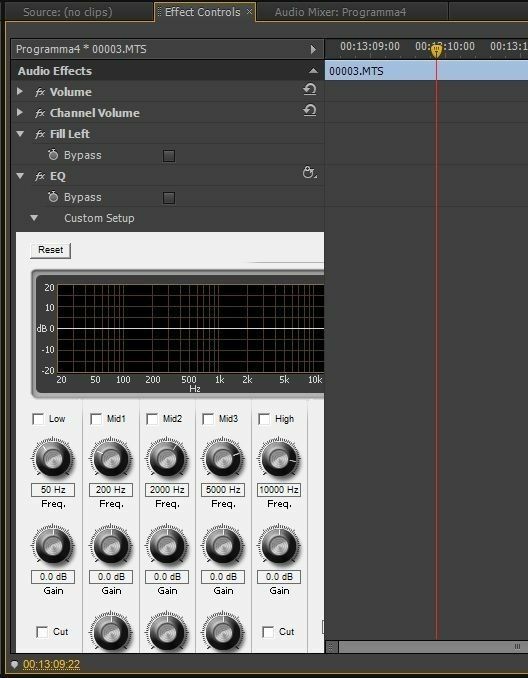 You may ask why to use the Volume effect when the volume can be adjusted using the sliders or audio gain tab in a right-clicked drop-down menu. The case is that if you have already edited the volume in above kinds of way and after that apply audio effects then the further editing might disrupt the settings. To avoid this, use the Volume effect. 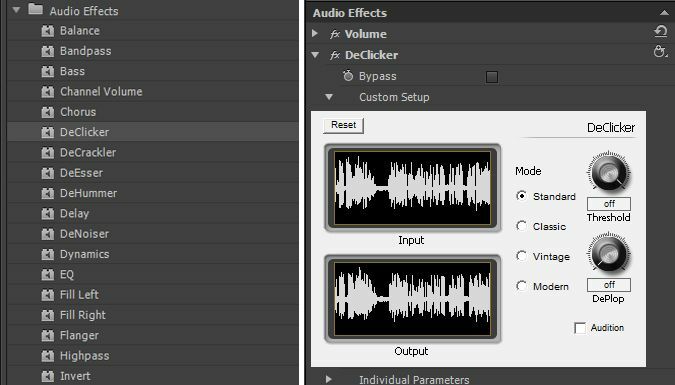 There are plenty more audio effects in Adobe Premiere Pro so don’t be afraid to experiment and find that very sound which your video project needs.